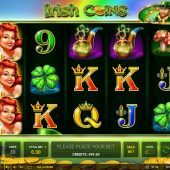 Irish Coins slot is another game which marks Novomatic's recent transition into contemporary themes for their output, in line with other developers such as Netent and Quickspin. This means brighter and better-animated graphics but results sometimes in juvenile or over-used themes too as we saw with their recent Little Dragons game. Here we have the stereotypical Irish look with shamrocks, leprechauns and the obligatory red-headed beauty but most Novomatic slots usually have a decent feature or two regardless of the appearance and to be fair we are spared the ubiquitous Irish fiddle music here and retain the basic trademark Novomatic trotting noise as the reels stop. Can any of these Irish Coins find their way into your pockets though? The grid is a standard layout of 5 reels of 3 rows and although it doesn't seem to mention this in the rules, you can see a symbol each game (while the reels are spinning) which is stacked more frequently than the rest although this could simply be the way the reels are presented. There are 20 lines in play for which you pay 30 coins per spin and the Coins are single Wilds appearing on all reels and pay 50x bet for a full 5-of-a-kind. 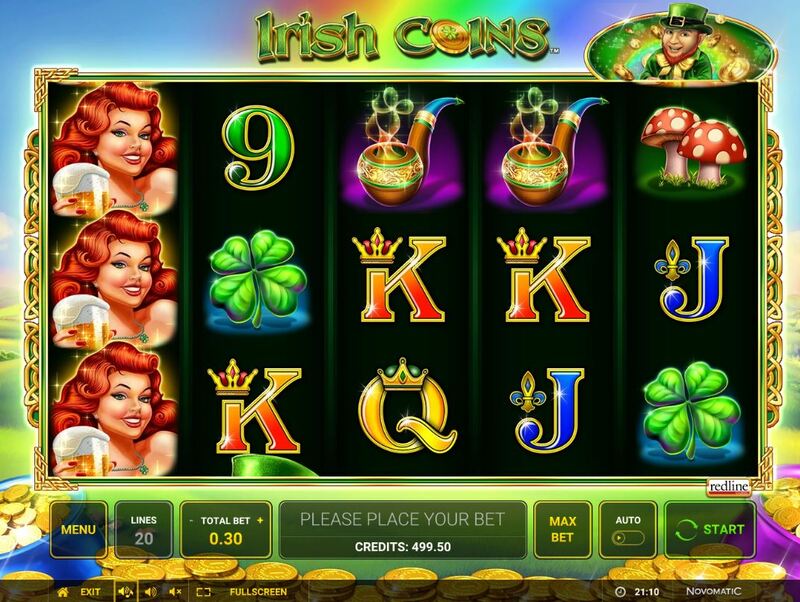 Other icons are single and stacked with the Leprechaun paying 500 coins, the Lady or Pipe 250, Shamrock or Toadstool 200 with six card values paying 100, 75 or 50 as they decrease in order. There is an Irish Coins Feature which is simply a random occurrence which will place. A random quantity of Wild Coins will appear on the reels as they spin which could mean that they not only have a better chance of landing but could end up in stacks too. If they land over a scatter it still counts. There are Wishing Wells appearing singly on all reels with a blue pot of gold lying next to them and you need 3 or more anywhere in view to trigger the free games feature. You get 7, 10 or 20 for 3, 4 or 5 respectively but there is a nice little surprise on reel 5 as one of the scatters on that reel has a purple pot of gold by its wishing well as opposed to the usual blue one. Should this be part of the triggering scatters it will randomly either double or triple the quantity of free games awarded therefore 60 spins are possible! You can retrigger them in the same way they are awarded. There is no multiplier but you should notice the Irish Coins random feature occurring more often in the bonus round.